Back on 9th May the Sprat & Winkle Quilters held a mini retreat workshop when we all started making our scrappy trip quilts. Today in an effort to complete some of the unfinished projects lurking in the “roundtoit” basket I managed to spend a couple of hours working on my version. 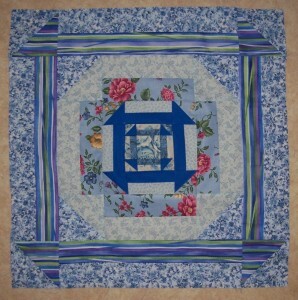 I used a jelly roll by Lewis & Irene to make 16 blocks of 12.5" squares. These have been sewn together without sashing or borders so that there is no “interference” with the design. I have layered with 80/20 cotton/polyester wadding from my stash and used a remnant of Pale Pink cotton for the backing. I plan to machine quilt a trellis design and finish with a narrow binding. 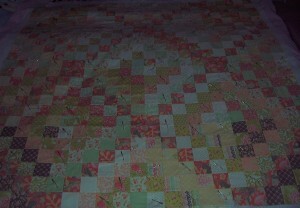 I recently visited an old friend who is currently clearing out her stash of patchwork and quilting fabrics. Most of the pieces are cotton from a variety of sources and I was delighted to unearth many swatches of Liberty Tana Lawn. I was even more pleased to find a length of just 1.5 metres x 90 cms width in a delightful floral print that just happened to be complimented by a tiny pin spot design with similar Blue background. Holding my breath, I placed the pattern pieces for what is my current favourite top onto the fabric to find that there was just sufficient to make up the design. My usual alterations, inasmuch as I omitted the centre back seam and button and loop fastening also extending the length by just over an inch. As a simple enhancement, I added two self-covered buttons to the accent rectangle below the contrasting yoke. 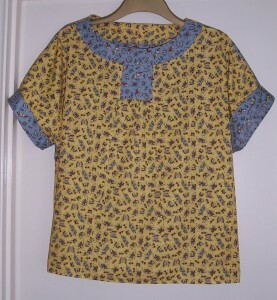 Hey presto, an afternoon of gentle sewing produced yet another delightful top for my Summer wardrobe. 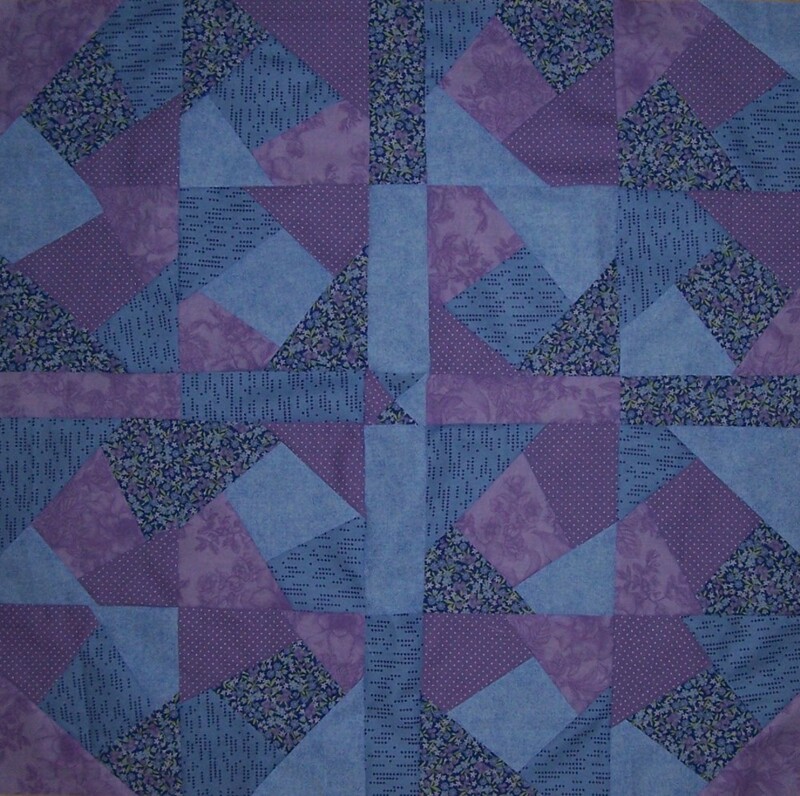 For the second incarnation of this pattern I used a length of fabric that I had purchased from one of the ladies at our Sprat & Winkle Quilting Group and although not stated I believe the fabric content to be cotton with perhaps a small percentage of polyester. 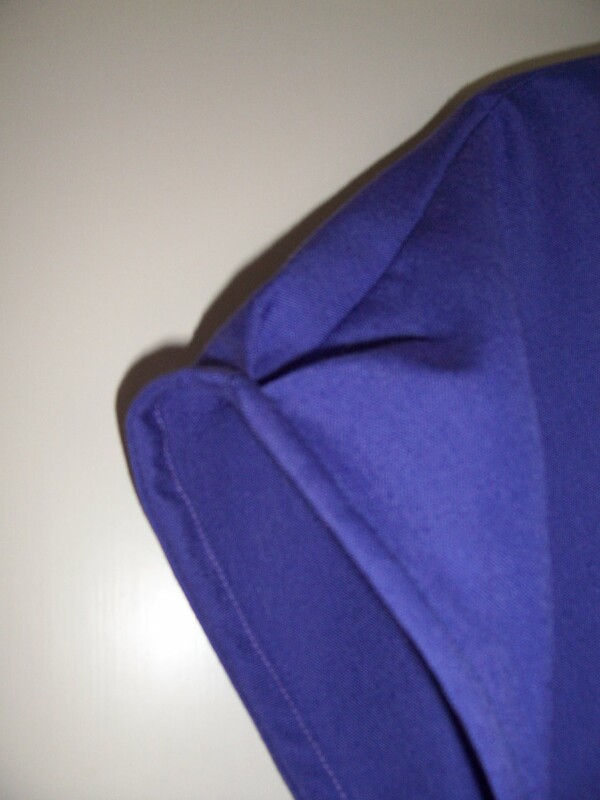 The construction was again very straightforward except that this time I added in-seam pockets. However, I did not allow sufficient extra width on the hips to accommodate the thickness of two pocket pieces and unfortunately when I sit down, the pockets gape. I shall have to re-sew the side seams and remove the pocket bags. 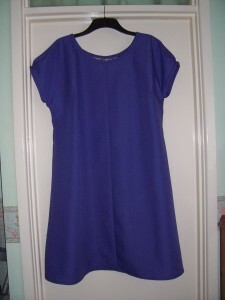 This dress is a very quick, easy sew and a useful addition to my Summer wardrobe. This project was to be one where I used some fabric from my stash. Whilst searching for inspiration I came across 2 x 1 yard lengths of Butterfly print with a background of Blue and Yellow. I decided to incorporate both colourways into a top using Simplicity 2245. 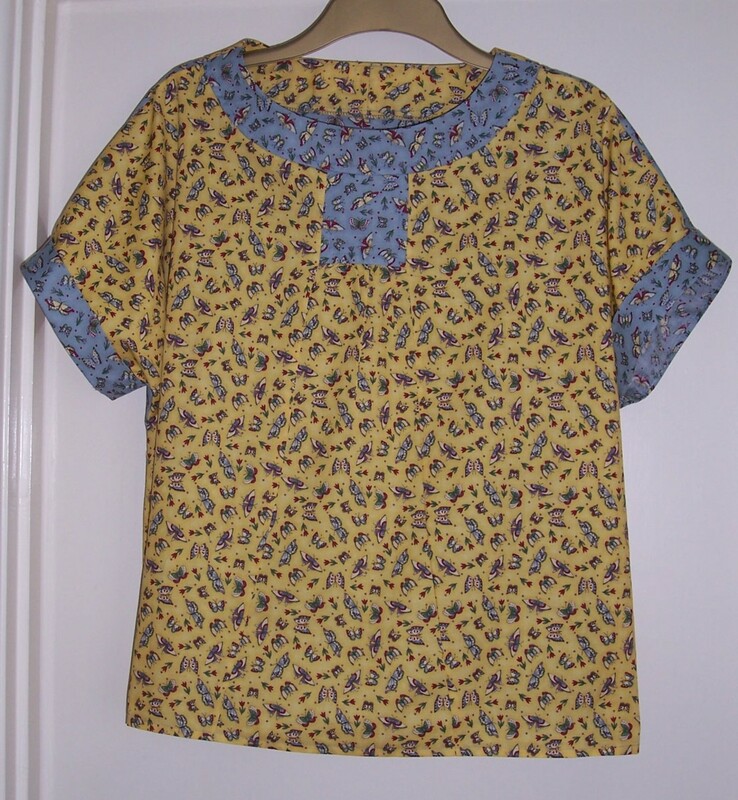 I cut the back, front yoke, feature rectangle and sleeve cuffs in the Blue colourway then the front, centre front panel and back yoke in the Yellow colourway. As this is the fourth time I have made up this design I am becoming quietly confident with the sewing order and fit. Construction details: I omitted the centre back seam and added 2 inches to the length. Within a couple of hours I had a lovely new and unusual top. Next project will be using some newly purchased fabric… watch this space. Last month I demonstrated Crazy 5-piece Stack and Whack to the Ladies at Franklins Monday Patchwork Group. Since then I had not looked at the project as it sat languishing in my “Round To It” basket. As the next meeting is tomorrow I thought I should have a look and get the top of the lap quilt completed. When putting the project away I had inadvertently jumbled up the sets of blocks that had been cut. I endeavoured to put them back into the correct order but obviously failed as the blocks when stitched were anything but square! To get a consistent size I had to square the blocks and they ended up a mere 7”. I knew that putting them together in sets of 4 without sashing would give a mean-sized lap quilt. I had strips of the fat quarters left over from the original cutting so decided to add sashing and a centre quarter square triangle. 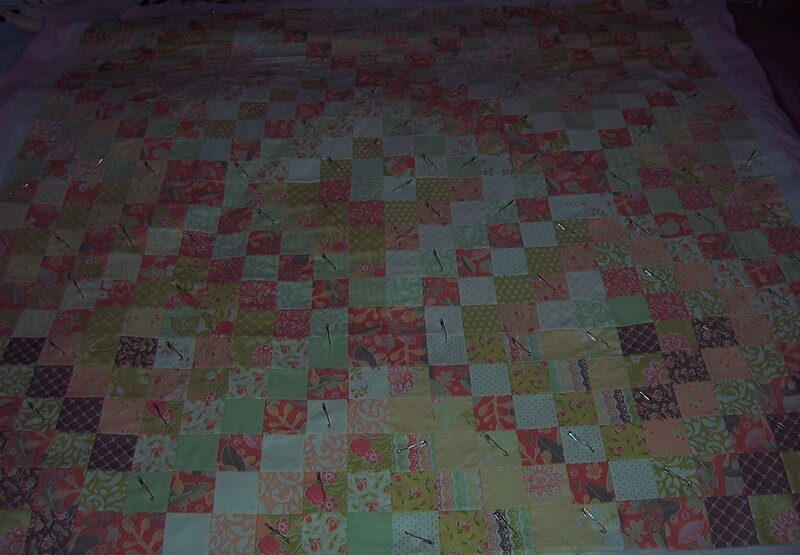 This quilt has ended up not only crazy but very random! The centre square is NOT square! However, I am pleased with the result and once the outer borders have been added and the quilt completed I shall heave a sigh of relief that here is another project that has avoided relegation to the unfinished basket! What I have learned from this block are two very important things. Firstly, to read the instructions fully and secondly don’t try to work a brand new (and initially complicated) block when you are feeling hot, tired and emotional! 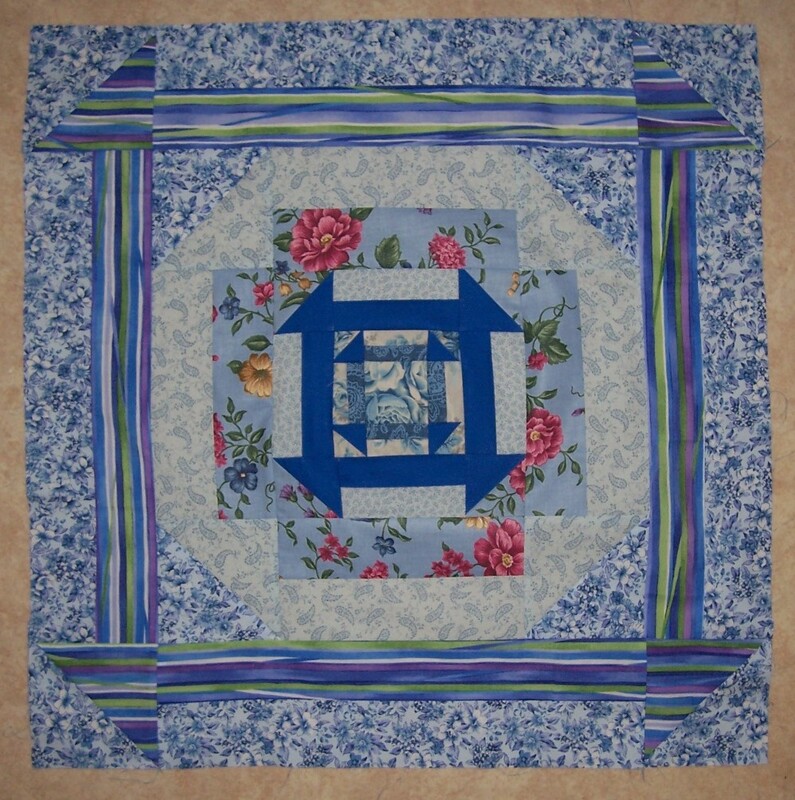 The Sprat & Winkle Committee have designated June as our “Projects for Charity” month and they suggested that the 24” square quilts to be donated to the Special Care Baby Unit in Winchester, could be worked using the Nested Churn Dash block. On Thursday evening our illustrious leader introduced the block and distributed a comprehensive set of instructions. Had I read those instructions properly, I would have discovered that the half square triangles are first made over-size and then squared up and cut to size. So my first round based on an initial centre square of 2” net has turned out rather “wonky” as I endeavoured to “fudge” the strips and half square triangles to fit! At home in the evening of Friday I sat down at the sewing machine with a view to finishing the block. After all it was only 24” square so how hard could it be? After a long day visiting a friend whom I have not seen in many years and is now suffering from cancer followed by a tortuous drive home as my husband and I endeavoured to avoid the traffic jams on the A303 what I should have done was settle down with a cuppa and relaxed for the evening. But no, stubbornly I continued with the Nested Churn Dash Block. There is an error in the placement of the prints but at the end I am actually quite pleased with the result – my feelings about the Nested Churn Dash are such that it will be a long time before I repeat this block. The alternative block suggested by the Committee is “Swoon” – I shall take a deep breath before I attempt that! 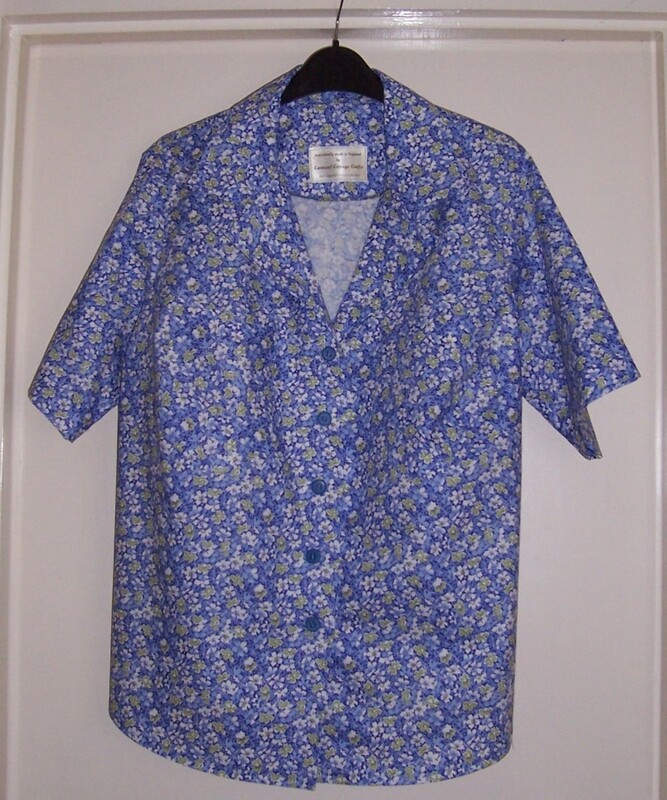 For my next project I decided to make the pretty Blue floral print cotton purchased from NEW THREADS at Weyhill Fairground into my standard blouse. 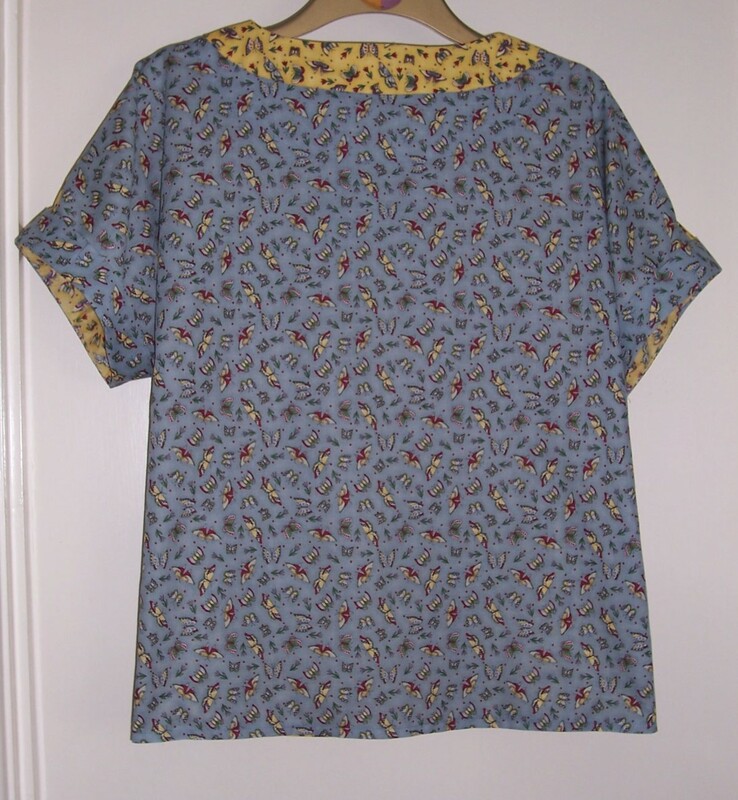 This pattern has been made up countless times, one day when I have nothing better to do I will count them – but I know that the first time I made the blouse was over 20 years ago! Since then I have hacked the Style 1441 pattern to remove the yoke, slimmed down the body and added a shaped hem. For regular followers of my blog you will have seen this design many times before. There is not a lot new to say about the construction process. I added two breast pockets with a single row of top stitching. 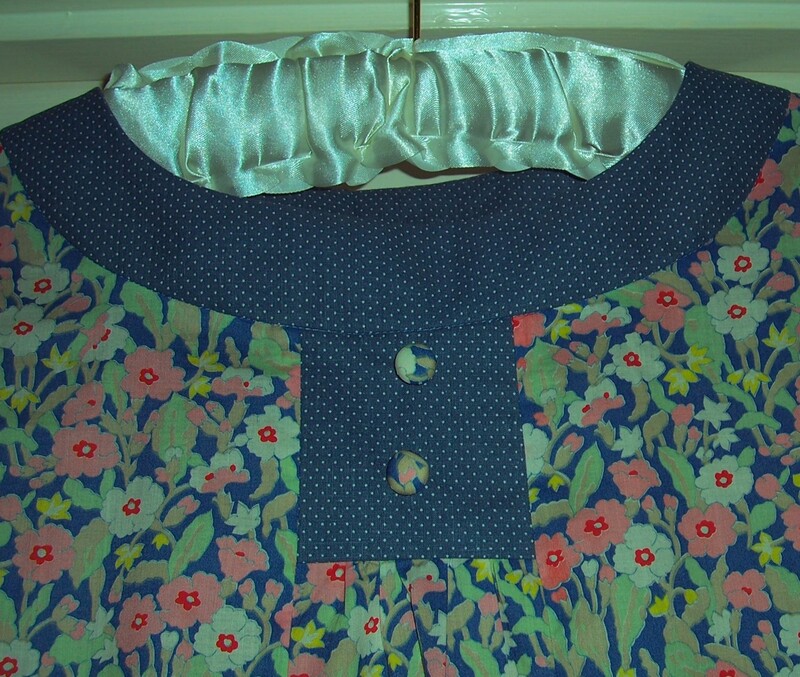 The collar also has a single row of top stitching, the sleeve hems and the shaped hem are machined stitched and there are five Blue buttons for the front fastening. 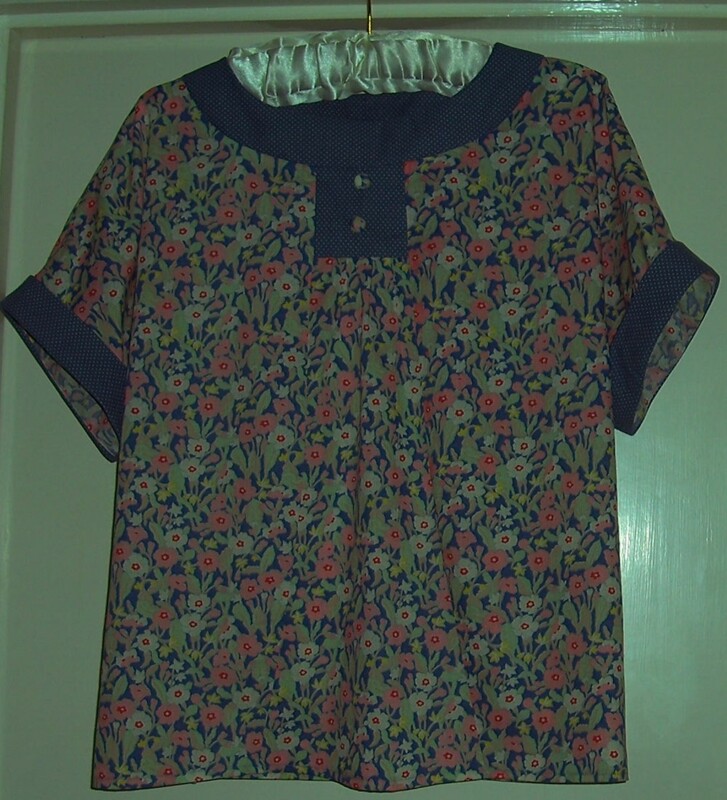 Having recently completed 2 time-consuming projects I decided to make a simple shift dress using a pattern that had been loaned to me by a friend. 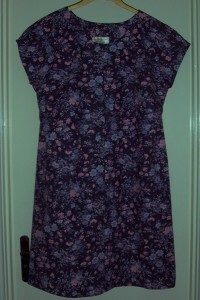 The fabric came from my stash and is a polyester based linen-look in a lovely shade of Dark Lavender. The overlocker was still threaded up with Dark Grey fabric so I just needed to re-thread the sewing machine with a co-ordinating colour for the Dark Lavender fabric. I could not find quite the right shade so have used a dark navy which I hope will blend sufficiently well not to be too obtrusive. The pattern is sized up to an 18 and I therefore added to the centre front, centre back and side seams. I hoped this would be sufficient an increase to accommodate my rubenesque figure. In the end I eliminated the extra width at centre front and also skimmed off some of the extra on the side seams. This pattern was a dream to sew and went together really easily. Being such a basic shape I can foresee that it will lend itself to many variations. 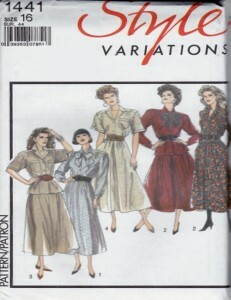 I have now ordered my own personal copy of the pattern. Notes for the next incarnation of this pattern – if using a heavy fabric (such as linen, linen-look, needlecord) use a fine cotton bias binding for the neckline and armholes, a contrast colour/print could be a good idea. The basic shape will lend itself to being cut for colour/print – blocking, reduce the length and make as either a tunic or even shorter, a top, check out a way of adding a longer sleeve for cooler weather wear. So that’s my stash busting project done, next on the list (yes I have a list which instead of getting shorter, gets longer as even more ideas flood my brain!) 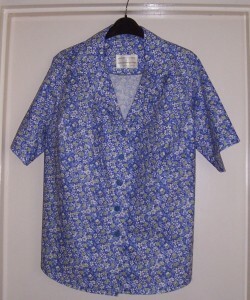 is a pretty Blue floral cotton print to be made into a blouse.